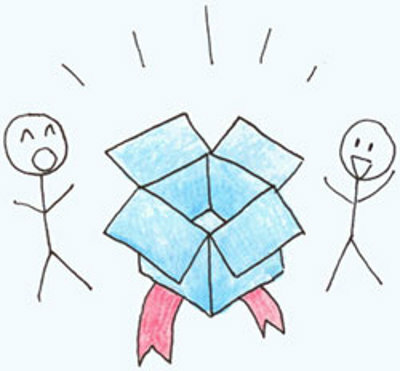 A nasty incident last night is the motivation for this Off-Topic post today about Dropbox. Scare: Last night around 11 pm, my wife called while visiting her family: quite a few files in Dropbox, which we use extensively – and typically flawlessly – for business and some private stuff are missing. Did I delete them? Details: A quick survey discovered that over 3 gigabyte of data of a total of circa 7 gb were deleted. Even stranger, they supposedly were deleted from my personal laptop, over a period of about two hours. Two more oddities: the files were deleted while I was nowhere near my computer; and: the deletions were very selective. Not complete folders went AWOL, but perhaps 90% in one folder, 5% in another, 60% in a third and so on. Some personal things, some business files, some software, some phone apps. You get the idea. Solution: Neither the hidden Dropbox cache nor the Events Timeline showing deleted files were complete and practical solutions for restoring several thousand lost files. But since I had worked in my office until lunch, the office computer did have a complete Dropbox snapshot, lacking only the last six or eight hours (the time between my shutting it off and the deletions). So last night I unlinked the office computer (and all others), changed the Dropbox password, and created an external backup of what was left of Dropbox and of the hidden Dropbox cache. This morning in the office then, I immediately turned off Dropbox sync (with an unlinked computer technically not necessary, but I had to be sure), then synced the office Dropbox folder with my the external backup and thus created a second identical copy, minus about eight hours of changes. Syncing that back to Dropbox on my personal computer restored 3gb of data, missing only a few files from yesterday afternoon, which I still have to hunt for in either “Previous Versions” on Dropbox or in the saved cache. Possible Explanation: From a logical perspective, I see five possibilities: 1. I personally deleted the data, or someone else at my laptop. 2. My wife deleted the data. 3. Our Dropbox is shared with another person/s. 4. The Dropbox servers conched out. 5. Our Dropbox account got compromised. Going down the list: 1: nope – I was not at my computer and home alone. 2: nope – cui bono? My wife and I work together, and she has neither reason nor time nor incentive to torpedoe our work and selectively delete over 18,000 files. 3: nope – it isn’t shared. 4: possible. 5: possible. Consequence: Despite Dropbox being brilliant most of the time, reliance on cloud-based storage is simply not justified as we all should know; I got my personal reminder last night. Only the fact that I have several computers linked to Dropbox saved my Speck. In the light of my experience – and I’m sure I’m not alone – the ever-increasing push in favour of cloud storage from mobile phone manufacturers to eliminate SD-card storage or from companies like Google to offer Net-Books without hard drives is deeply flawed, risky and plain irresponsible. Do not fall for it. Did you have a similar experience with any cloud-based storage? Please share it, and also any preventive measures you implemented – thanks! The second Quarter 2013 sales statistics for single family homes in the tricounty area Palm Beach, Broward and Miami-Dade didn’t surprise: traditionally, May and June are the busiest sales numbers throughout any year, and 2013 continued the trend. Probably a major factor in this purchase pattern are families moving into desirable school districts as soon as school is out for the summer, so everything is place when the new school year starts in August. In addition, a lot of cash floating around needs to be parked somewhere, so when stocks, bonds and gold are a tad volatile, what’s the average millionaire to do? Hide it? No – buy waterfront homes; what else? One prospective buyer reprimands me at every contact, in a stern tone of voice: “I will not let the market force my hand to buy something”. He has been completely priced out of the market, but still clings to the believe he has the upper hand. Correct in some way: he didn’t have to buy, and now he can’t, because he waited to long. 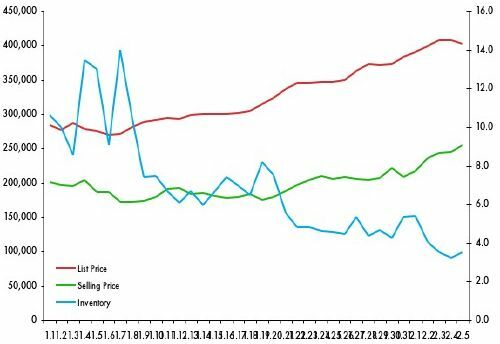 SE Florida single family homes: inventory, median asking prices and median selling prices, June 2010 - June 2013. Source: Kaiser Assoc. My specialty, modern architecture, is especially difficult: inventory under ca. $900,000 has fallen off the cliff in the last 10 to 16 months, and is now basically wiped clean. The few good modernist homes that come to market typically sell within a few weeks, often only days, without ever seeing the MLS, to registered buyers ready to act with their finances all lined up. For the near future, unless some unforeseen events happen, I do not expect a drastic change in direction, though according to a new CoreLogic/Case-Shiller report, some analysts predict a trend reversal for 2014. This August at least seems already a bit saner, if one can tell in the middle of the month. With Florida home ownership rates on the decline and affordability dwindling, calmer winds would not be a bad situation. For now – if you own a modern home and have questions about it or consider selling: I’d love to hear from you!